-PREPARE Dinner in large saucepan as directed on package except do not top with Bread Crumb Topping. -STIR in spinach and pepper; cook and stir 2 min. or just until spinach is wilted. -STIR in bacon. Sprinkle with crumb topping. Serving Suggestion: Serve with smart sides such as your favorite steamed vegetable and a crisp mixed green salad. I've always been a sucker for mac & cheese. 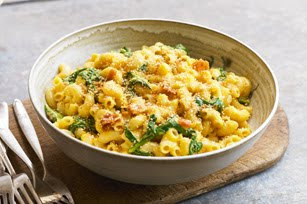 In fact, there's a super fancy restaurant near us that has the most sinful mac and cheese I've ever had, and I told Chris that that's where I want to go tomorrow for my birthday haha!! Holy deliciousness... how dare you post this the day I start my new "healthy eating lifestyle" ;) Looks so good! YUM! I may have to try this out!